How to convert to high-definition video with Xilisoft Video Converter? How to convert to high-definition video? As we know, when we convert videos to other formats, the quality of videos will decline. How can we get the high-definition video which is close to the original video? Here, Xilisoft Video Converter can help you do it. It can get the video with “Same quality” and “2-pass” settings of the program. The “Same quality” function enables you to get good output video quality as the source. The “2-pass” function enables you to execute a pre-encoding session before the actual encoding session starts, so the encoding time will be much longer than a normal session, but will provide you with a smaller output file size with the same image quality, or a better file with the same size. 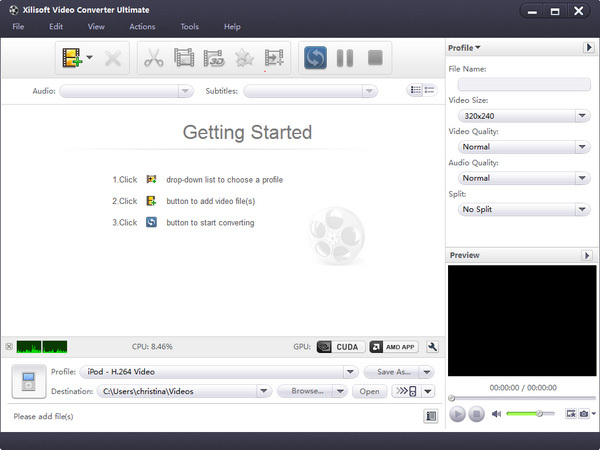 Now let’s focus on how to get high-definition video with Xilisoft Video Converter. Select the files need to be converted and click “Profile” button to select the “HD-MPEG4 Video” output format in the drop-down list. Then click “Browse…” button to specify destination folder for saving output files. Open the “Advanced profile settings” panel, and check the “Same Quality” and “2-pass”. Click the “Convert” button from the menu bar, then the conversion is started, and the status becomes to the progress percent for your reference. Now you can get the High-definition video. How to convert HD movie to SD video? How to fast convert HD video to SD?